When the air gets really dry and the humidity drops, the wood of our beautifully made guitars can dry out. When this happens, the wood contracts, and in some cases, it may leave the metal frets protruding a little over the edge of the fretboard or even worse, the table of the guitar might crack. I know! A good luthier can help out. There are lots of ways to increase humidity around the home. There are dedicated gadgets that can puff out a cool mist, containers that can be filled with water and hung from radiators and of course drying a washing load of laundry on a radiator will result in a lot of water evaporating into the atmosphere. A hygrometer will measure the humidity levels and you can keep a check on the fluctuations. Houses with good double glazing and central heating can be far less draughty than older more ventilated properties, so it might be worth considering what humidity level you have in your own home? In times gone by, I used to buy cheap square, cleaning sponges, cut them into bits about the size of a mobile phone, and place a wet one, which I had wrung out, in-between the treble strings of my guitar when not in use. It was very cheap! and certainly dried out fairly quickly doing its job nicely. 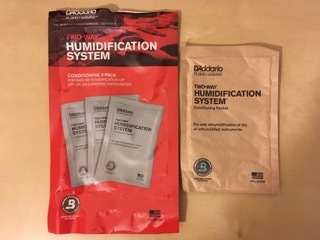 These days, I’ve become a little more lazy and use the D’Addario humidification system as shown above. It seems quite an expensive way of keeping the humidity level within the guitar case at about the right level, but it’s low effort and convenient. D’addario says that the gel pack adds and removes moisture from the case, maintaining relative humidity of 45-50%. When it becomes dry and crispy, it’s time to replace it!